The manual was created for a workshop and includes details on the process I followed to publish both the paperback and digital versions of Buying Time: An Aspen Moore Novel. 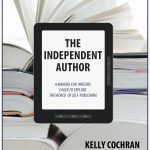 The manual covers my journey to publication, including the paperwork required, step by step formatting of the book, development of the cover, and what I did to market my book. The manual is currently under revision and will once again be available to purchase at the end of 2016. I will update this page with specifics on where to the purchase the manual once it becomes available.